Redefining the Future Marina, Worldwide. ASAR is a smart storage solution that will add to your profits and your entire marina! By automating the storage and retrieval process, you can increase your marina’s usable, leasable cubic space, enhance operating efficiency, and enjoy the benefits of an unmatched rack-to-water vessel delivery every time. This advanced technology will allow you to store more boats in your dry stack facility, and provide a faster, more reliable storage system for you and your customers. Additionally, replacing the traditional forklift or crane method with ASAR reduces the risk of environmental hazards, damage, and theft. 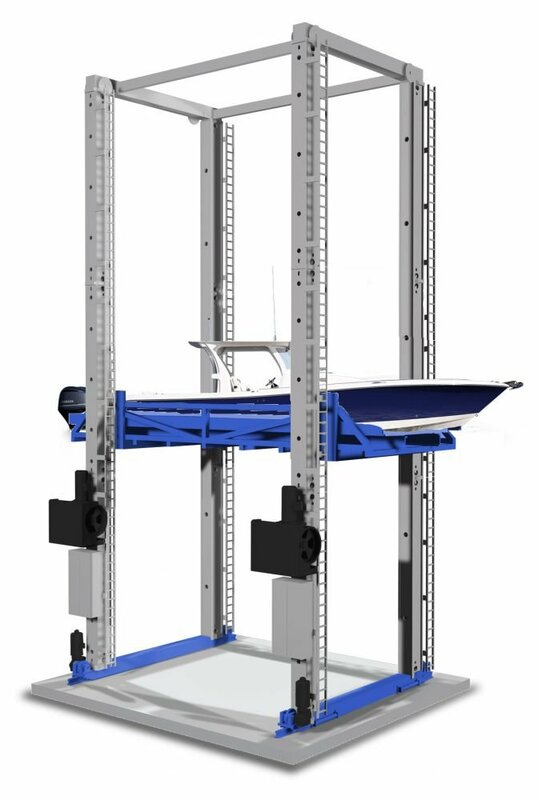 ASAR replaces the traditional forklift or crane, which is prone to operator error and slower delivery, with a fully-automated stacker crane that safely hugs the hull of the boat and moves it on a track that gently slides both side-to-side and up-and-down. Superior to a forklift or crane in every way, ASAR lifts at up to 3.5 miles per hour and drives at up to 11.4 miles per hour, offering the redundancy of dual drive motors and dual lift motors. Furthermore, it takes the boat directly from the water all the way to its storage space within the dry stack, even cleaning it along the way via an optional vestibule washdown system. ASAR is smart business, it’s that simple. The marina owner is able to achieve higher density storage in four major ways: the flexibility to store multiple vessels horizontally, the capability to store full-size vessels on the top rack, a 30% increase in leasable cubic space, and a 44% reduction of drive aisle space needed through the elimination of a forklift or crane. By liberating conventionally unusable cubic space, the return on investment (ROI) continues to multiply through the entire life of the marina. This increase of leasable cubic space, without the increase of footprint, is particularly valuable to the marina owner in a high-value real estate market with limited space. ASAR is the product of the smartest minds in technology today, and it’s being used by the smartest business owners. Designed by GCM Contracting Solutions, in partnership with LTW Intralogistics, ASAR is a smart storage system. Fully automated from rack-to-water, ASAR provides a 99% uptime and the ability to store vessels of varying depths with larger boats stored on the top rack. GCM Contracting Solutions has partnered with LTW to provide ASAR to its customers. In fact, our project, Gulf Star Marina, will be the first location in the world to offer fully-automated storage and retrieval to the marine industry.